The Coveo Google Drive for Work Compact connector fully supports the Google security model. When you want users searching for Google Drive content in a Coveo search interface to only see the content to which they have access in Google Drive, the connector needs a security provider to be able to index the permissions for each indexed Google Drive item. In the drop-down list, select Google Apps (x64). In the drop-down list, select (none). You must select this option when you plan to use this security provider with a Google Drive Compact (Google Apps) source type. Select the security provider that you selected or created to allow this security provider to resolve and expand the groups (see Google Drive for Work Compact Connector Deployment Overview). Enter the domain that you want to index. When your Google Apps account contains more than one domain, you can enter a semicolon-separated list of domains to index. 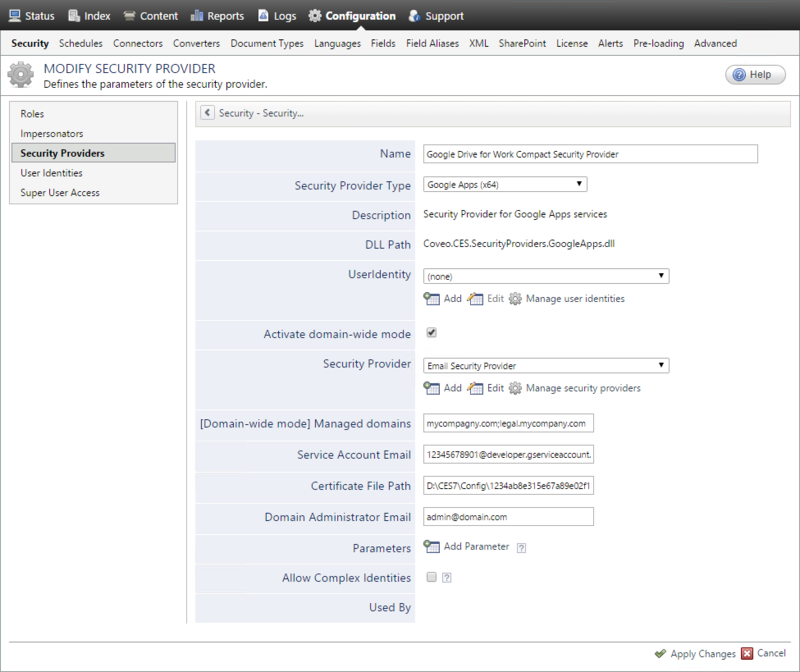 The security provider will resolve and expand groups for the specified domain(s). Enter the service account Email address previously obtained (see Authorizing the Coveo Connector to Access Your Google Drive). Note: This parameter can be left empty when you use the CertificateFileData hidden parameter (see CertificateFileData). Enter the path on the Coveo Master server where you saved the previously obtained service account's PCKS12 private key file (see Authorizing the Coveo Connector to Access Your Google Drive). Create and index a source (see Configuring and Indexing a Google Drive for Work Compact Source).